It's a funny thing. 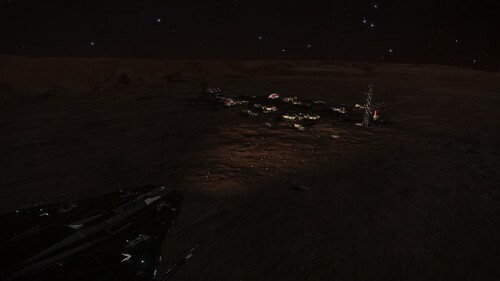 I'm sat here, lights blazing, looking at an abandoned... research? site in the middle of bleedin' nowhere. 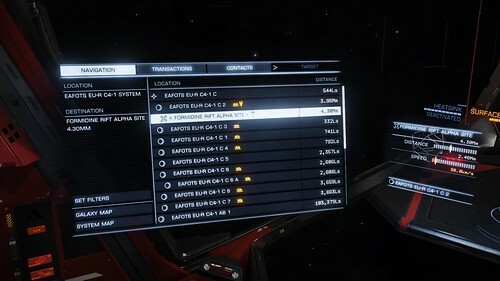 Some 8000LY from home and what do I see on my scanner? A high wake pattern. It's too far gone for me to scan now but someone was out here. That probably shouldn' be weird, bein' that people lived here once upon. But it looks like it's been quiet a long time now. Dust settles' you know? And there it is, a wake. See, you heard the ol' line. Space is big, real' big. So the chances of bein' this far out and happenin' across a fellow traveller are fairly remote. I mean to say, there are bases within a klick or two, but still, it's a cold dark black out here to be just missing someone. Were they, like me, just looking? Or were they involved... in whatever this place was here for. Hell, they didn't even pack up. I might take the buggy out, have a nose around. But prior to that, I spent the last day jumping down this way. It's a well trodden path. I gave Salome's world a looksee - it's an Amonia world some 170,000LS from arrival, so that took a bit of time to skate over to. 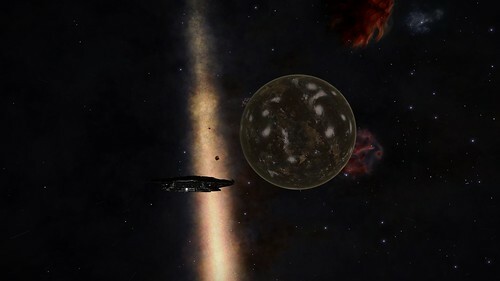 Nothing particularly remarkable about it, but again, we all know what those bugs like, and it's Amonia. So, was she looking for them? Or somethin' else? We'll never know now I suppose. After that, I took my leave and headed here. 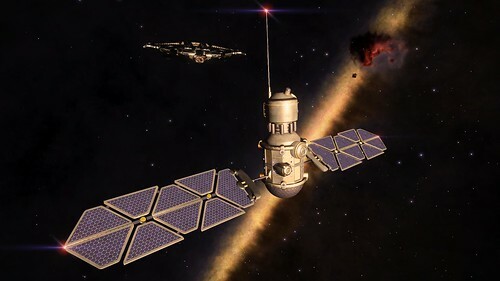 In this sector of space there are now, at least found so far, four bases used as outposts and research stations. Again, I'm goin' back a few on this, and I doubt there's much of anything to discover here, but it's still spooky in its own right. I figured, I got a few thousand light years to go before I find this ghost ship I'm after, and a pit stop ain't gonna... heh, I was gonna say hurt - but that's untrue. I ain't stepping foot in these places personal. No sir. Might never leave. Might catch me a cold. Interesting thing. I landed in-system and honked. Found a couple of unregistered beacons. Ain't nothing comin' out of them though. No scans, no noise. They're there though; probably just a friendly hello to those that called this place home for a time, but I gave them a look anyway. Then to the prize. Or the first of em. As I say, I ain't stepped foot yet, but I landed and thought I'd write up first. You know, just in case. Gave my girl a system-reset. I'm still getting a power quirk somewhere inside. Swear last night, I heard the thrusters power up themselves, cycle and die. I was out for the count though, so probably in my head. I mean, failsafes stop that kinda nonsense out here. Unless I got a gremlin on board. Heh.